Gala Prasad preparation at Janmabhoomi temple, Mathura which is the birth place of Lord Krishna, has started 5 days before of Krishna Janmashtami. 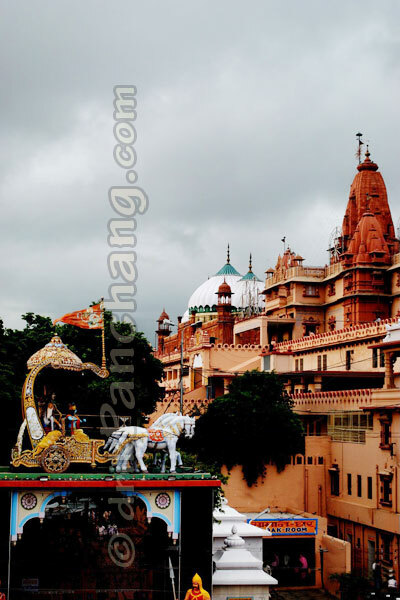 It is customary to offer Bhog to all devotees who visit the temple on Janmashtami day. Due to expected increase in number of devotees who would visit the temple the amount of Prasad has been doubled compared to that of last year. The distribution of Prasad would start at 8 a.m. and continue till late night on Janmashtami day which would be observed on August 28. The Janmashtami celebrations would start from morning and would continue beyond midnight. About one Lakh Laddu(s) would be offered to Lord Krishna as Prasad which would weigh about five thousand kilograms. Along with Laddu(s), eleven hundred liters of Panchamrita (पञ्चामृत) would be prepared and distributed along with Prasad. Panchamrita which is also known as Charnamrit is a mixture of five food items namely honey, Ghee, yogurt, milk and sugar. Often Basil leaves and dry fruits are also added to it. Such a huge preparation of Prasad needs cow milk in great quantity which is arranged with the help of Veterinary University Mathura, Janmabhoomi trust Goshala and Gokul-Mahavan Goshalas. Devotees throng the temple from far-flung places throughout the day and feel blessed by getting Prasad and Panchamrita.